As Holly and Gary started planning to hike Mt. Kilimanjaro for their 40th wedding anniversary they realized that having the right shoes was one of the most important factors for a successful climb. Just as the difference between success or failure in summiting Africa’s highest peak can be “all about the shoes”, for people in Africa plagued by jiggers, shoes can be the difference between health and debilitating illness. Jiggers are a tiny flea-like insect that burrows into the skin and continually lays eggs, which then hatch and lead to an infestation. The results of jigger infestation are pain, itching, and infection. Children stop walking to school. Adults can’t care for their families. The elderly become captive in their homes. Worst of all, due to widespread cultural beliefs, people infested with jiggers are often shunned for the “curse” painfully visible upon their body. 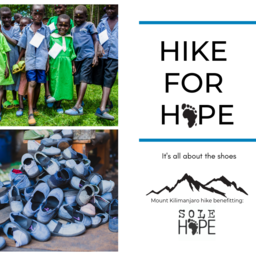 Sole Hope aids Ugandan people to become jigger free, restoring health and hope for a future, through education, medical care, and shoes. Quality, close-toed shoes are the easiest way to prevent jigger infestation and for just $10 Sole Hope is able to provide those shoes to a person in Uganda, along with education and any necessary medical care. Therefore, we decided to dedicate our climb to Hike for Hope with the goal of raising $5300; $100 for each of the 53 miles of our journey on Mt. Kilimanjaro. Every penny of this goes to Sole Hope to fund projects that provide the education, tools, resources, and manpower to fight jiggers. For Sole Hope it’s also, all about the shoes. Thank you for helping us make a difference! Because of YOU, #hopeiswinning!